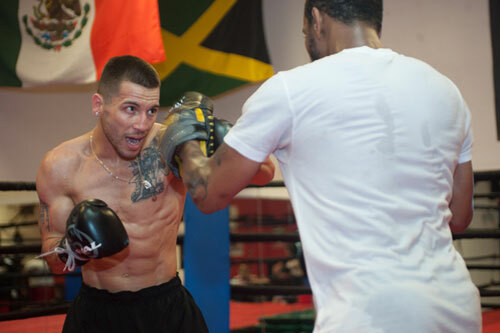 Before catching his flight to Beijing, China, junior lightweight title challenger Jason Sosa, 18-1-4, 14 KOs, held one last stateside workout at the Victory Boxing & Fitness Gym in Cherry Hill, NJ on Wednesday. 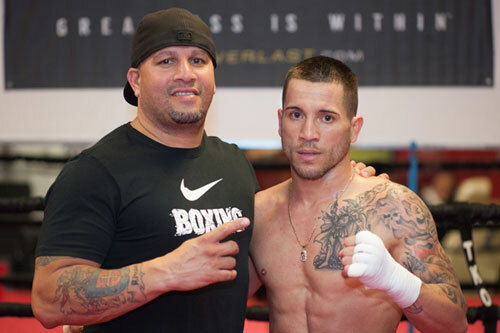 Sosa takes on WBA champion Javier Fortuna, 29-0-1, 21 KOs, at the Capital Gym, next Friday, June 24th. The fight will be telecast on Chinese TV, but will not be aired in the USA. Sosa, Camden, NJ, is currently ranked #8 by the WBA, and earned this, his first world title shot, primarily on the strength of his December performance against two-time world champion Nicholas Walters. Most believed that Walters would blow Sosa out of the ring. However, Sosa surprised everyone in the fight by holding the undefeated Walters to a 10-round majority draw. The moral victory for Jason sent the message that the Camden fighter was ready to take on the rest of the 130-pound division. Now he gets his chance to win the WBA title and keep himself in the mix at junior lightweight. Let’s hope that Sosa isn’t too different next Friday night. He has earned a reputation as a busy, crowd-pleaser, and has remained unbeaten for the past six years. Sosa looked to be in shape and ready to go for the biggest fight of his life. Team Sosa departs for China on Thursday. Watch for a full interview with Sosa during fight week.